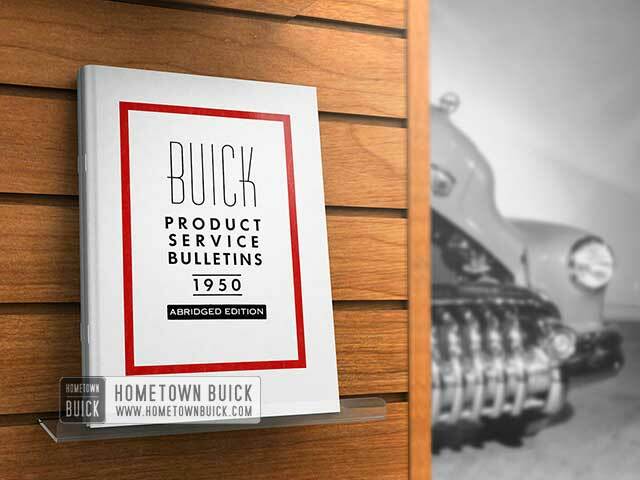 During the past few months it has been reported that the standard 1950 Buick Electrical Systems testing procedure is not sufficiently complete for checking batteries which become discharged repeatedly in service. The procedure has been to recharge at the low rate the battery which has become discharged and to subject it to a high rate discharge test. If the test results were satisfactory, the battery was returned to the customer’s car. In some instances it has been found that the battery in question would satisfactorily meet the high rate discharge test, and yet become dis­ charged again within a relatively short time after being put back in service. A second and even a third test and retrial gave similar results in certain cases. To avoid loss of time and customer goodwill in handling batteries of this type, the following modified procedure should be used. ANY DEALER NOT HAVING THE NECESSARY EQUIPMENT TO MAKE THE FOLLOWING TESTS SHOULD SUBMIT BATTERIES TO THE LOCAL U.M.S. OUTLET. On occasion of first reported complaint, check 1950 Buick electrical system of car completely, including regulator setting (See page 47 of this bulletin). If no cause of battery discharge is determined, completely recharge battery in accordance with following instructions, adjusting specific gravity if necessary. Make high rate discharge test as specified. If results are satisfactory, return battery to customer’s car. On occasion of second complaint check specific gravity and open circuit cell voltages of battery as received. Non-Uniform Readings If specific gravity readings vary more than 25 points (.025) between cells, and if open circuit cell voltages vary more than 0.10 volt, battery may be considered defective and subject to warranty or adjustment. If specific gravity readings vary less than 25 points (.025) and if open circuit voltage varies less than 0.10 volt, completely re­ charge battery according to following instructions and return to customer’s car. Make careful study of owner’s use of car to determine possible outside causes of discharged condition of battery. Special care must be taken in recharging batteries in preparation for high rate discharge test. To insure a complete recharge under all circumstances, batteries should be recharged at a constant current of approximately 1 ampere per positive plate per cell (15 plates – 7 amperes, etc.). Watch battery temperature and lower rate if temperature reaches 110°F. Hydrometer readings should be recorded hourly for each cell of battery as soon as it approaches the fully charged state. A battery is fully charged when the cells are all gassing freely and the gravity ceases to rise for three successive readings taken at hourly intervals. Excessive gassing of the electrolyte may cause the liquid to exhibit a falsely low gravity due to the small gas bubbles displacing the liquid. Allow the gas bubbles to rise to the surface of the liquid in the hydro­ meter barrel before reading the hydrometer float scale. As the battery approaches full charge (while on charge at the 1 ampere­ per-positive plate rate), the charge voltage will depend upon the temperature and condition of the cells. A uniform charge voltage for all of the cells in any particular battery is a condition to be desired – a subnormal voltage of one of the cells may indicate a defect such as a broken separator or an internal short. Stop charging any battery when all cells are gassing freely and gravity will not rise further when tested at three hourly intervals. Most batteries can be recharged at normal rates in from 12 to 16 hours. Excess charging is wasteful of current, decomposes water, and is harmful to the positive plates. Do not stop short of the fully charged state, however, as outlined above, even if it takes 24 hours or longer. A badly sulphated battery will require a longer time than a normal battery. Never adjust the specific gravity of any cell which does not gas freely on charge. Unless electrolyte has been lost through spilling or leaking, it should not be necessary to add acid to a battery. Acid should never be added unless it is certain that the cell cannot be brought up to normal specific gravity by continued charging. Remember to make the temperature correction for hydrometer readings, as warm electrolyte will read low and this might be mistaken for failure of the battery to rise normally in specific gravity. It might also be mistakenly concluded that the battery will not take a full charge. The specific gravity of all cells should be within the range 1.275 – 1.290, corrected to 80°F., at the end of a full charge. If the specific gravity is too high, remove some of the electrolyte with the hydrometer and add water. If the specific gravity is too low, add 1.400 specific gravity electrolyte in small quantities. Continue the charge in order to mix the electrolyte, and read the gravity at the end of one hour to note the effect of the additions. Continue this adjusting procedure until the gravity is brought to the desired value. Charging must be continued for at least one hour after each adjustment. High rate discharge equipment is available in a variety of forms. Most of these work on the principle of discharging the battery at a high rate of at least 100 amperes through a fixed resistance for approximately 30 seconds. Cell voltages are measured during the discharge and com­ pared for uniformity. IF CELL VOLTAGES VARY MORE THAN 0.2 VOLT DURING HIGH RATE DISCHARGE, THE BATTERY MAYBE CONSIDERED TO BE NO LONGER SERVICEABLE. To eliminate the extreme effects of temperature on battery discharge characteristics, battery temperature should be approximately 80 F. at the time of starting high rate discharge test. NOTE: When a complete preliminary recharge of the battery is necessary, do not make the high rate discharge test until the battery has been allowed to stand for at least two hours. In the very near future, some cars shipped from the factory, will be equipped with AC Spark Plugs bearing the printed designation “Patented CORALOX” on the insulators. At the same time, plugs shipped for re­ placement may bear this designation and/or may be shipped in newly designed cartons which state “with CORALOX insulator”. We wish to advise you that these plugs do not differ in any respect from the AC plugs manufactured during the past three or four years, consequently, existing service recommendations will apply. This fact should be strongly emphasized to all service personnel so that we can avoid needless new spark plug replacements made in the belief that the newly designated plugs offer some advantage over present types. This change should not be confused with our recent change from type 48 to type 46-X plugs. At some future date, all AC spark plugs will bear the new designation on the insulators and will be packed in the redesigned cartons. Current field service reports indicate more than a normal seasonal in­ crease in complaints on batteries. The greatest increase in complaints has occurred wherever unusual type of driving service and traffic or road conditions contribute to under-charging of the battery. Since the charging rate to the battery is largely dependent on the voltage regulator setting, unusual types of driving service often require a special voltage regulator setting. Because of the important effect of temperature on battery charging characteristics, special regulator adjustments may also be found necessary to meet seasonal and climatic conditions in certain areas. Battery discharge resulting from excessive use of accessories while generator is idling or inoperative, accidental discharges, etc., does not warrant a change in the voltage regulator setting. To prepare battery for calibration, select a satisfactory new 6 volt automotive storage battery, and charge slowly (1 ampere per positive plate) until fully charged. Specific gravity of electrolyte should read between 1.275 and 1.290 in all cells. Allow battery to stand overnight at approximately 80°F. for stabilization of voltage. Battery terminal voltage will then be 6.4 volts. DO NOT USE BATTERY FOR CALIBRA­ TION IMMEDIATELY AFTER CHARGING SINCE BATTERY VOLTAGE WILL BE ABNORMALLY HIGH FOR SEVERAL HOURS. NOTE: The calibrating battery may also be used to check open circuit type battery testing meters by measuring the voltage of one cell. Cell voltage of the calibrating battery will be 2.13 volts. CAUTION: Do not work on generator regulator with engine running unless extreme care is taken to see that hands and equipment are not damaged by fan. Using recently calibrated voltmeter, check and adjust voltage regulator setting as described in 1949 Buick Shop Manual, Paragraph 10-29, or by using the “Fixed Resistance Method” described under the paragraph entitled “FIXED RESISTANCE METHOD TO TEST GENERATOR REGULATOR ON CAR”. If setting is 7.4 volts or less, and persistent undercharging occurs – adjust voltage regulator within the range of 7.4 – 7.7 volts. SETTING MUST NOT EXCEED 7.7 VOLTS UNDER ANY CIRCUMSTANCES. If new voltage regulator setting is correct, battery should remain adequately charged with a minimum usage of water. To determine correctness of new setting, owners should be encouraged to return for battery check after two weeks. If battery requires additional water oftener than once a month (2,000 miles), new setting is too high and should be reduced accordingly. In checking the operation of the voltage and current regulators two methods may be used. The variable resistance method, which has been recommended in the past and which is described in Paragraph 10-29 of the 1949 Shop Manual, uses a variable resistance connected in series between the generator regulator and battery. When using this method to check the current regulator, it is necessary to remove the cover and to connect a jumper wire between the voltage regulator armature and upper contact to prevent the voltage regulator from operating during the test, thereby making it difficult to maintain the regulator temperature. Inaccurate results may be obtained due to change in temperature and due to the condition of battery at time of test. Turn selector switch to 10V. Turn ground switch to’ ‘NEG”. Insert 100 AMPERE SHUNT with BLUE plug into “AMPS ONLY” SOCKET. Remove battery lead #10 wire having red and black crossing tracers from ”BAT” terminal of regulator and attach flexible lead from shunt to the “BAT” terminal from which wire was removed. Attach other end of shunt to battery lead removed from regulator. Connect yellow clip to “GEN” terminal of regulator. Connect black clip to ground on base of regulator. Connect jumper wire between terminal marked “f” and ground on generator so that voltage regulator cannot operate. This is advisable because an improperly adjusted voltage regulator may prevent the cutout relay from closing. Start engine and warm it up until it is running on slow idle and adjust speed to 350 R.P.M. CAUTION: Never run engine faster than 1400 RPM with “F” terminal grounded. A higher speed may cause damage to generator. Increase speed to 1250RPM. Ammeter should read approximately 40 amperes. If it does not, check fan belt for proper tension. If the specified amperage cannot be obtained, with correct fan belt tension, the generator should be removed for a bench test. See Paragraph 10-27 in 1949 Shop Manual. Test and adjust cutout relay in exactly the same manner as described in the 1949 Shop Manual under a-5, 6 and 7 Page 10-31. Shut off engine. Remove jumper wire and disconnect 100ampere shunt and blue plug from instrument. CAUTION: Since voltage regulator is compensated for temperature, the regulator must be tested at operating temperature. Turn SELECTOR switch to “REG” position. Turn GROUND switch to “NEG” position. Turn regulator switch to “6V” position. Insert voltmeter lead with red plug into “VOLTS AND AMPS” socket. Connect yellow clip to “BAT” terminal of regulator. Connect black clip to a good ground on regulator base. Start engine and increase speed to approximately 1500 RPM. Run engine for at least 15 minutes to permit the regulator to reach operating temperature. REGULATOR COVER MUST BE IN PLACE. Cycle the regulator by reducing engine speed until cutout relay points open, then bring engine speed back to approximately 1500 RPM. The reading obtained on the voltmeter will be the voltage regulator operating voltage and should be between 7.2 and 7.7 volts if properly adjusted. The ammeter will show a generator charging rate of 8 to 19 amperes. If no ammeter reading is obtained, check the 14 ampere fuse in the tester. If voltage is not within specified limits, adjust regulator as described in 1949 Buick Shop Manual under c-4 and 5 Page 10-33. Leave test equipment connected for the following test. CAUTION: Since the current regulator is compensated for temperature, the regulator must be tested at operating temperature. With the test equipment connected as above, and immediately following above test, while regulator is hot, increase engine speed to 2000 RPM. Depress “REGULATOR TEST BUTTON”. Ammeter will read 40-46 amperes if current regulator is properly adjusted. If charging rate is not within limits specified, adjust as described in 1949 Buick Shop Manual under c-5 and 6 Page 10-32. Stop engine and disconnect test equipment. Connect wire to “BAT” terminal on regulator. See engine speed to 450 RPM. We have had several reports that dealers are having trouble replacing map lamp bulbs on 1950 models. These bulbs are very easily changed without removing the radio or any other parts of the instrument panel assembly. The procedure for replacing map lamp bulbs is clearly described on page 20 of the 1950 Buick Owners Guide. Mechanics should familiarize themselves with this guide before performing minor service operations on the 1950 jobs.